Beloved author Cecil Murphey empowers readers to discover the good in every situation and to make life better because of adversities. Sometimes life gets messy. It's cluttered with too many demands. Companies downsize. Love relationships end. Trauma hits. When chaos erupts, every person has a choice to make--to decide whether it’s the worst time of life, to find comfort in the way things used to be, to move on because change is forced, and then resent everything that happens, or to say, "This can be the best time of my life. I can try the things I wanted to do but never did." 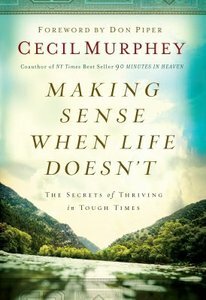 In Making Sense…When Life Doesn’t, Cecil Murphey's compelling stories, hope-filled insights, and gentle encouragement move readers with messy lives to the stunning realization that life won't ever be perfect, but it can be good...even exciting! About "Making Sense When Life Doesn't"
Customer Reviews For "Making Sense When Life Doesn't"
It really is worth the read. Sometimes when life doesn't make sense, this book puts into perspective what God might be trying to tell us. There are many ups and downs in life, everyone goes through that. This books lets you know how to make life more enjoyable, and look at things from a different angle.